“To Solar Safeguard (NW) Ltd.
“To Mike of Solar Safeguard (NW) Ltd. 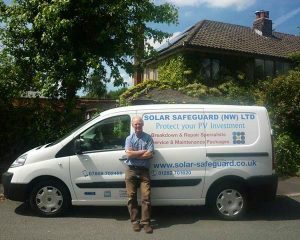 Thank you very much for your excellent work, help and advice today, concerning our solar panels. 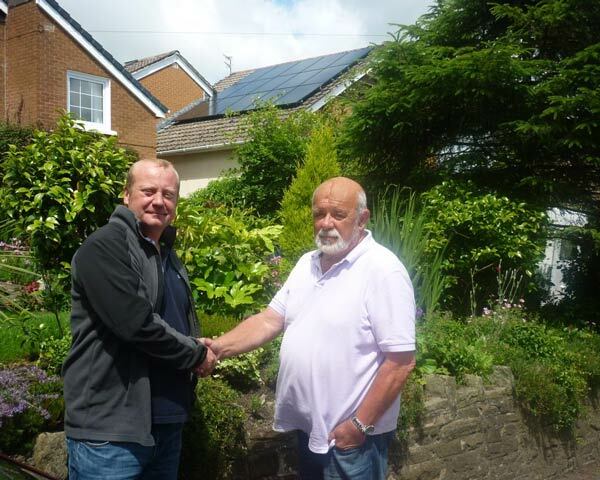 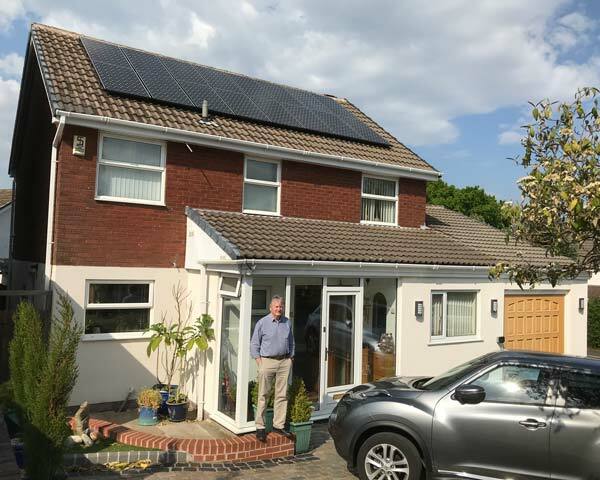 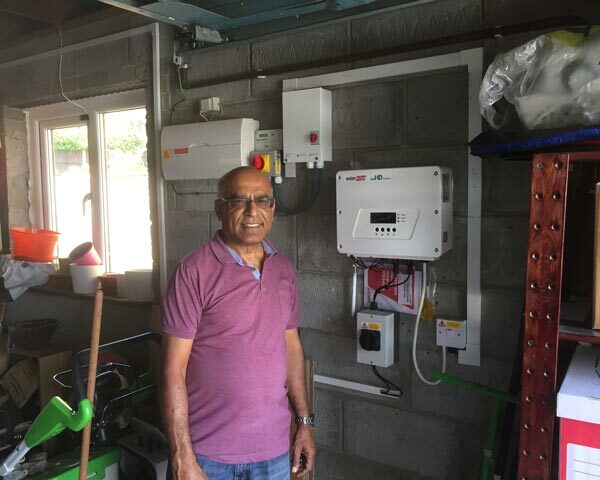 “Having invested a lot of money to have solar panels installed last year I was somewhat dismayed to learn that the firm who installed them has now ceased trading – due to the Government having hugely reduced the ‘Feed-in Tariff’. 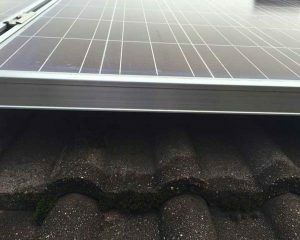 I was planning to have them do an annual maintenance/ clean of my whole system. 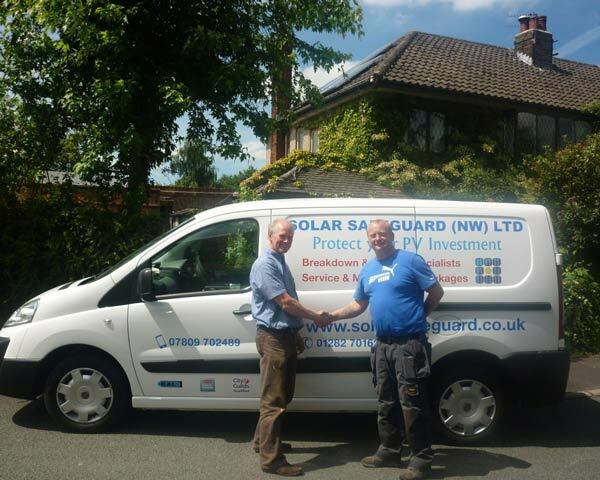 However, the ‘Good News’ is that Mike Bailey, who was the Installation Manager for a large UK based Solar Energy company, has now formed a new company, ‘Solar-Safeguard’, and offers a complete annual maintenance and cleaning service at an extremely good price. “My wife and I decided that we should make a move toward renewable energy for both financial and ecological reasons for the future. 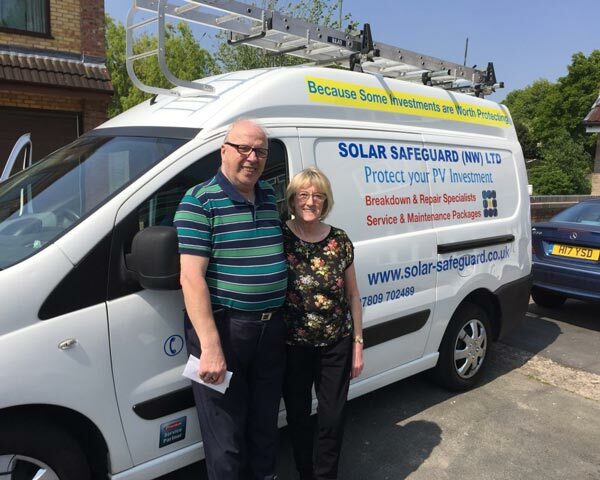 We decided upon a local supplier who arranged one of their sales / surveyors to visit us and talk over the details, answer our many questions and recommend a system that would meet our needs. 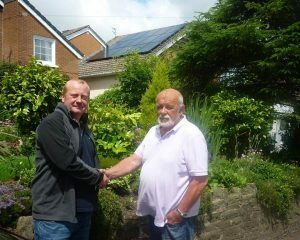 At the outcome of this meeting we signed up for our system with 15 solar panels. 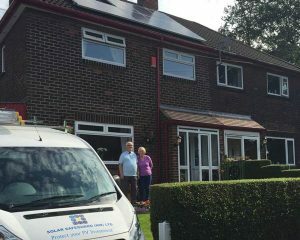 Initially we thought this would be a lengthy operation but on the following Saturday Michael and his colleague turned up to install our system. 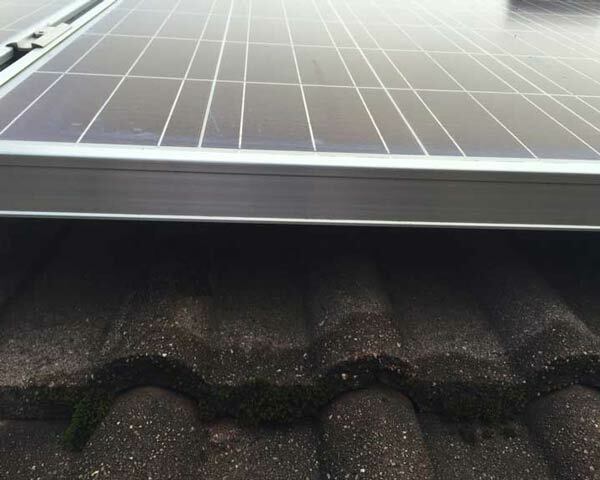 It was obvious from the start that Michael was someone who takes pride in his work and before you could say “solar energy” he announced the completion of the job and that he would like to go over the operation with us. The job was neat and our house left totally tidy as we sat back and to enjoy the benefits of our new system. 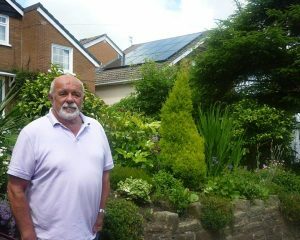 Some months in and the system has performed faultlessly with great results. However we were shocked to learn that the installation company had recently ceased to trade and felt we had been left “High and Dry” You can imagine our relief to be contacted by Michael to assure us he would be continuing the service and support of his installation through his own venture called Solar Safeguard (NW) Ltd.
“Mike Bailey at Solar Safeguard (NW) Ltd has become my electrician of choice over recent months. 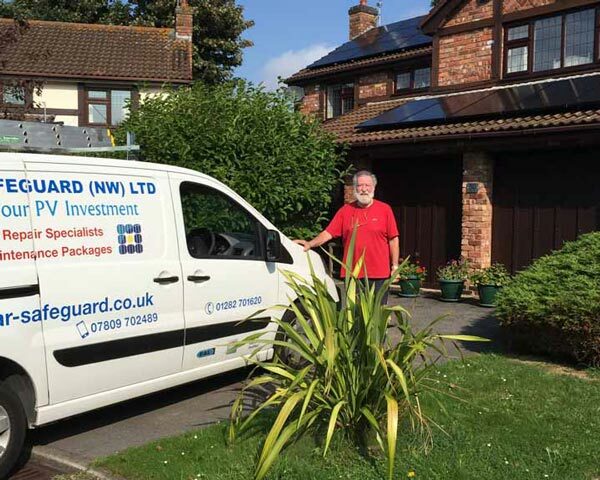 His work is always top notch and at very reasonable rates. 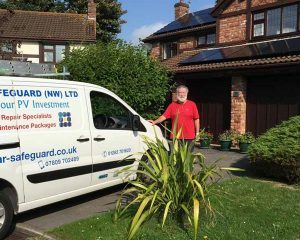 He is always friendly and cheerful to deal with, but most importantly he is reliable and always arrives when he says and keeps in touch.